The Dutch Roman limes zone has a rich history of archaeological and historical research. In this paper, we present an overview of the current state of knowledge as an introduction to other chapters in this volume dealing with the area’s demography, economy and transport system (Chaps. 2, 3, 7, 9 and 12). The main historical developments are sketched against the background of ongoing archaeological research in the area, and the main hypotheses concerning the development of settlement and the rural economy are discussed. 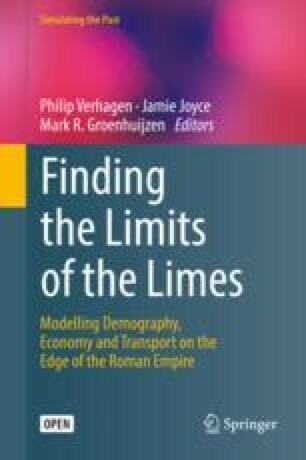 In this chapter, we sketch the geographical and historical setting of the Dutch Roman limes, together with background on the research history in the area and an overview of the main hypotheses on economic and demographic developments in the region. It serves to set the scene for the chapters dealing with modelling of the demographic development, subsistence economy and transport networks (Chaps. 2, 3, 7, 9 and 12). Inevitably, however, it can only touch the surface of a substantial and lively debate in Dutch Roman archaeology and should therefore be considered as a basic introduction. We have provided numerous relevant references to more in-depth studies for those wishing to know more about the details of specific research projects and the theoretical debate. The Dutch limes zone roughly comprises a 50 km wide strip in the middle of the Netherlands, stretching from the North Sea until Germany over a distance of approximately 150 km from west to east. To the north, the zone is bordered by the course of the Rhine, which was established as the northern frontier of the Roman Empire around the middle of the first century CE. The Romans never clearly demarcated the geographical extent of the limes, but it may have meant as much as a zone of hundreds of kilometres wide (Whittaker 1997). For all practical purposes, however, the Dutch ‘limes zone’ can be defined as the extent of the two civitates, or allied states, of the Batavians and Cananefates immediately south of the Rhine. The exact extent of these civitates remains somewhat speculative, but it is thought that the Batavian civitas covered the zone roughly to the east of the current town of Woerden up into current Germany, and to the south it would have reached a few kilometres inland from the Meuse (Maas) river (Vossen 2003; Vos 2009). The Cananefatian civitas occupied the western half of the limes zone, roughly delimited to the south by the current provincial borders of Zuid-Holland (Fig. 1.1). This region has undergone considerable environmental and anthropogenic change over the past 2000 years, leading to substantial changes in river courses, coastline, vegetation and land use. The Rhine diverted its main branch to the south in the course of the Early Middle Ages, and the current coastline dates from the Late Medieval period. Peat reclamation in the Late Middle Ages and Early Modern period created the current polder landscape, and large-scale urbanization in the nineteenth and twentieth centuries further altered the rural landscape. All in all, the current region would be almost unrecognizable to the inhabitants of the Roman period. This means that no meaningful historical and archaeological analysis of the Dutch limes zone can be undertaken without a reconstruction of its palaeogeography. Fortunately, a palaeogeographical map of the north-western part of the limes zone was already assembled by Van Dinter (2013) on the basis of an extensive database of geological bore holes collected by the University of Utrecht, and of detailed LiDAR-based elevation data. We have followed her methodology to complete this reconstruction for the remaining area of the study region. A detailed description of the data sources used and the methodology applied is given in Groenhuijzen (2018). On the basis of this reconstruction, we can broadly distinguish three major landscape zones in the Roman period from east to west. To the east of the current city of Utrecht, the landscape was dominated by fluvial landforms: river beds, levees and flood basins. These areas were mostly suitable for all kind of agricultural activities and posed no serious challenges for settlement and transport apart from the major river crossings. In a few places, glacial moraines form more pronounced hills; the city of Nijmegen was founded on one such outcrop. To the west of Utrecht up to the coastal dune area, the landscape was much wetter. Here, the levees only occupied narrow strips of land surrounded by vast areas of marshland and peat. Opportunities for settlement and agriculture were much more limited here. Finally, the coastal dune area formed a narrow strip of more elevated terrain that was eminently suitable for human occupation. Palaeobotanical evidence indicates that the limes zone was already largely deforested before the Roman period (Kooistra et al. 2013). More detail on the suitability of the landscape for human settlement and agriculture is given in Chap. 7 (Joyce). The interest in Roman frontier forts in the Netherlands has a long history and received its first impetus by the discovery of remains of the Brittenburg fort on the seaside near Katwijk in the sixteenth and seventeenth centuries (Dijkstra 2011). However, more focused research on the presence of the Romans in this part of the Netherlands only started with the excavations on the site of Arentsburg near current Voorburg by Casper Reuvens in the early 1800s, where the remains of the Cananefatian civitas capital Forum Hadriani were unearthed (Reuvens 1829). By the early twentieth century, Dutch archaeologists, operating from the State Museum of Antiquities (RMO) and the University of Leiden, had established the location of a number of Roman forts in the area and partly excavated a few of them, in particular the fort at Vechten (Fectio; see Polak and Wynia 1991). However, the structure and development of the limes forts remained rather obscure until the 1940s, when excavations by the University of Groningen at Valkenburg (Praetorium Agrippinae) yielded masses of new information (Van Giffen 1948, 1955), in particular since organic materials were very well preserved in the waterlogged conditions along the Rhine. The Valkenburg fort therefore remains one of the best known examples of a Roman castellum . From then on, the number of known forts steadily increased through research by the State Service for Archaeological Research (ROB), universities and amateur archaeologists. 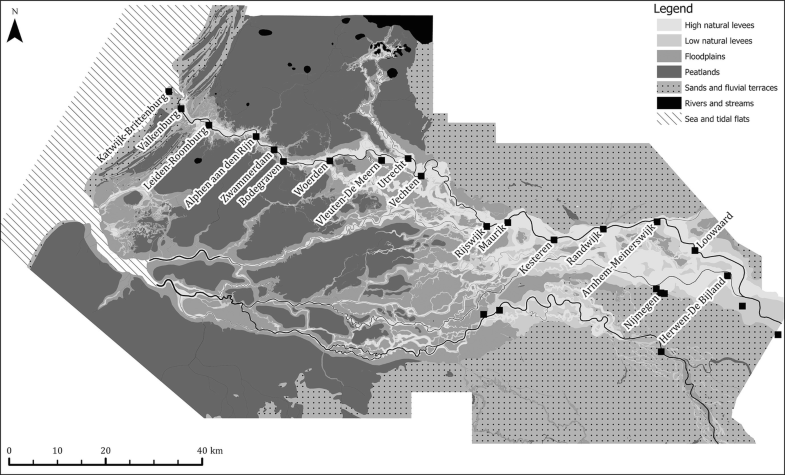 A spectacular find was the discovery of six Roman shipwrecks in Zwammerdam between 1971 and 1974 (De Weerd and Haalebos 1973; De Weerd 1988), again pointing to the importance of the Dutch limes zone for the preservation of organic remains. In the eastern river area, the course of the Rhine has shifted considerably since the Roman period, having obliterated many traces of occupation along the river. Consequently, very little new data on military sites in the eastern region has been added to the information that was available in the early 1990s (Bechert and Willems 1995). To the contrary, the western river area, where no substantial erosion has taken place, has yielded large amounts of new information over the past 20 years. This was spurred on by the new system for heritage management in the Netherlands which allowed for commercial excavations from 1998 onwards, and included more finds of Roman shipwrecks at Vleuten-De Meern (Van der Kamp 2007, 2009; Langeveld et al. 2010), and hitherto unknown smaller forts at Bodegraven (Van der Kooij et al. 2005; Vos et al. 2016) and The Hague-Ockenburgh (Waasdorp 2012). The position of the Roman forts west of Wijk bij Duurstede is therefore now well established, with the exception of the Brittenburg fort which is thought to have been eroded by the North Sea. A good overview of the development of the military infrastructure in the Dutch limes zone before 37 CE is given by Polak and Kooistra (2013). For the later period, however, a comprehensive synthesis is still lacking, even when the investigations of the individual forts have been published in much detail. Most of these are in Dutch, making them less accessible to the outside academic world. The hinterland of the limes was traditionally less intensively studied, even though the city of Nijmegen (Noviomagus) has been a focus of investigation since the 1970s, since it is the only major Roman town and military centre in the Netherlands (Willems 1990; Willems and Van Enckevort 2009; Van Enckevort and Heirbaut 2010). The first regional analyses of the rural areas were published by Tom Bloemers (1978) and Willem Willems (1986) as part of their PhD research. Bloemers’ study focused on the site of Rijswijk-De Bult, and he took great efforts to use the excavation results to understand the development of rural settlement of the Cananefatian area. Willems, on the other hand, worked on an overall inventory of settlement for the Batavian area, and produced one of the first truly regional archaeological studies in the Netherlands. The problem that both had to confront was that the excavation evidence and survey data were difficult to reconcile. The number of excavations at the time was limited and concentrated on the larger sites, so many of their conclusions have now been challenged, even when their work is still valuable for its broad overview. Since then, the rural areas have become the focus of intensive academic and heritage management driven research with large surveys and extensive excavations carried out in the Kromme Rijn region (Vos 2009), the area around Tiel (Vossen 2003; Groot 2008; Heeren 2009), the Midden-Delfland region (Van Londen 2006) and the Maaskant region (Jansen and Fokkens 1999). A relatively recent research focus is the military road connecting the forts, which has become the subject of detailed investigation since the early 2000s (Luksen-IJtsma 2010; Van der Heijden 2016). The region that would become the limes zone in the Netherlands is mentioned first in the historical record by Julius Caesar (BG 4.10). While Caesar’s campaigns brought him to the Rhine in 55 BCE, possibly even fighting a battle at the bifurcation of Rhine and Waal, he had no great interest in the region (Willems 1986) . Roman interference at first remained restricted: the Roman policy seems to have been to repopulate the area with allied tribes and control it in that way. In 16 BCE, this strategy proved unsuccessful when Germanic tribes raided into the Roman-controlled areas to the west and south of the Rhine. Possibly, these raids were triggered by the building of a legionary camp (castra) housing two legions at Nijmegen-Hunerberg in 19/20 BCE (Driessen 2007). In response, emperor Augustus dispatched his general Drusus, who, within a few years’ time, launched three major campaigns into Germanic territory. Legions were stationed in Nijmegen, Xanten and Mainz in 15 BCE, and in 12 BCE the Roman fleet sailed into the North Sea to fight the Frisians and Chauci on the north coast of Germany. The operation included digging one or more canals and the construction of a dam in the river Waal to provide better access to Lake Flevo. There is no archaeological evidence of other military camps associated with this campaign, and the Nijmegen castra was abandoned in 12 BCE. By this time, the native peoples in the Lower Rhine region could already be divided into the Cananefates of the western region and the larger tribe of the Batavians in the east (Willems 1986). The military base of operation was evidently thought to be effective, since the first Roman fort on Dutch territory was constructed in Vechten, probably between 5 BCE and 0 CE, at the entrance to the Vecht river (Zandstra and Polak 2012). During Germanicus’ campaigns in 14–16 CE, two more castella were founded, at Velsen (Bosman and De Weerd 2004) and Arnhem-Meinerswijk (Willems 1980). The limes at that point in time did not exist as a military or political concept: Velsen is located to the west of Amsterdam, where the Oer-IJ river flowed into the North Sea. Nijmegen remained the centre of military operations, even when the military camp was much reduced in size after Drusus’ campaigns. The town of Oppidum Batavorum developed alongside it from approx. 10 CE onwards and served as the Roman administrative and economic centre. It is doubtful whether the limes was, in this period, a well-organized infrastructure (as it clearly is in later periods) or rather a set of loosely connected key points. In 28 CE the supposedly pacified Frisians rebelled against Roman taxations and laid siege to the Velsen castellum. After this, the Romans withdrew their troops to the south of the Rhine. Emperor Caligula took up the plan for the invasion of Britannia in 39 CE, leading to a new phase of military activity in the area. A fort was erected at Valkenburg, a new one built at Velsen, smaller fortifications were constructed in Alphen aan den Rijn and Vleuten-De Meern, and a first road may have been built to connect the forts along the Rhine. After the death of Caligula, emperor Claudius decided that it would be impossible to maintain two offensive armies stationed in the Lower Rhine area, one to fight in Britain, and one to fight in Germany. Instead, the Rhine was fixed as the northern boundary of the Roman Empire. During Claudius’ reign, the number of forts expanded quickly. With the exception of Leiden-Roomburg, all known forts to the west of Vechten date from before 50 CE. These forts are assumed to initially have been built to protect shipping on the Rhine (Graafstal 2002). In addition, a new castra was developed at Nijmegen and numerous watchtowers were erected between the fortifications. General Corbulo, who oversaw the operation, also had a canal constructed that connected the Rhine to the Meuse estuary via an inland waterway. This makes clear that the Lower Rhine limes was designed as a transportation infrastructure more than anything else. Where archaeological evidence is available, it is observed that the first forts were somewhat makeshift constructions made from earth and wood, which were already extended and repaired within a few years’ time. The exact occupation strength of the forts is unknown, and it is doubtful whether they were at all times fully occupied. Each fort could station one cohort (technically 480 soldiers); the one at Vechten was built to house a double cohort. It is considered plausible that the forts were initially manned with local (Batavian) auxiliaries (Haalebos 1997), although nothing is certain in this respect (De Weerd 2006). In this early period of Roman occupation, local and new groups were encouraged to settle in the region, leading to both economic development and population increase. Continuity of settlement from the pre-Roman Late Iron Age is likely with the rural population living in small settlements engaging in mixed agriculture with a focus on pastoralism that was characteristic of the Germanic tribes of the region (see Roymans 1996). A treaty between the Romans and Batavians (and perhaps also the Cananefates) is inferred from Tacitus (Germ. 29) in which the local population was exempt from taxation and instead supplied manpower for the army. In fact, ‘no other population group within the empire was as intensively exploited for recruitment purposes’ (Derks and Roymans 2006, 122). The actual number of recruited individuals has been discussed in a number of studies (e.g. Alföldy 1968; Bloemers 1978; Willems 1986; Vossen 2003). Verhagen et al. (2016a) demonstrated the negative impact on population growth that removal of young adult males from the marriage pool could have. Recruitment could also have had a negative impact on the availability of labour. The impact of incomplete households on agricultural productivity in the study region was discussed briefly by Van Dinter et al. (2014), but there remains scope for further discussion (see Chap. 2, Séguy and Chap. 3, Verhagen). In 69/70 CE, a revolt among the tribes of the Dutch limes zone is attested in the historical sources (Tac. Hist. 4), connected to a much wider Gallic uprising related to the struggle for power in Rome after emperor Nero’s death. Archaeological evidence shows that almost all forts along the Rhine were burned down, but they were rebuilt quickly. In order to keep better control of the region, the Romans built a new castra in Nijmegen and stationed the 10th Legion there. Oppidum Batavorum was deserted, and the population moved to the site of Nijmegen-Waterkwartier, where Ulpia Noviomagus, as the civitas capital of the Batavians, eventually developed into the only major Roman town on Dutch territory (Willems and Van Enckevort 2009). The policy of stationing local troops in the forts was changed. Auxiliary troops were now recruited from different parts of the empire, and included plain infantry, cavalry and naval units, although the emphasis is on infantry. Only Vechten and Vleuten-De Meern have yielded evidence for the existence of a civilian settlement before 70 CE, in all other cases the vici seem to date from after the Batavian revolt. It is probable that from then on taxation was imposed on the local population (Groot 2008; Aarts 2013) and the area became formally incorporated into the empire as part of the province of Germania Inferior. From this point on, the Cananefatian civitas capital of Forum Hadriani started to grow into a small town (Driessen and Besselsen 2014). The limes became the formalized frontier of the Roman empire, and the linear system of forts seems to have been quite stable for a long time. Even when the military occupation strength in Germania Inferior was considerably reduced under emperor Trajan in 103/104 CE, there is little indication that this also led to a reduction in occupation of the limes forts (Polak 2009). In cases where we have sufficient evidence, it is clear that the forts and the connecting limes road were repaired, extended and improved on several occasions (Graafstal 2002; Van Rijn 2011). The major building activities are associated with the reigns of Hadrian, Marcus Aurelius and Septimius Severus. In the late second century, all forts were rebuilt in stone (tuff). Recently, it has also become plausible that a coastal defence system was established after approximately 150 CE (Dhaeze 2011). Recent studies (Roymans 2004; Van Londen 2006; Groot 2008; Vos 2009; Heeren 2009; De Bruin 2017) have abundantly made clear that, despite the incorporation into the province of Germania Inferior, developments in the Lower Rhine region remained specific to the area and do not fit very well to generalized models of Roman ‘colonization’. Even when Roman material culture and customs were gradually more and more adopted, both the Batavians and Cananefates continued to emphasize their own cultural identity throughout the Roman period, as is clear from inscriptions, building types, material culture, religion and subsistence economy. In particular, rural settlements consisting of byre houses remain abundant in the zones surrounding the limes forts. The end of the occupation of the limes forts is debated but is generally put around 275 CE, after the collapse of the short-lived Gallic empire, although Heeren (2017) argues that discontinuity cannot be proven and that some forts were garrisoned until 293 CE. It seems, however, that already in the mid-third century occupation was not maintained at the intended level, although there is no clear sign of abandonment of forts in this period. The prolonged political and economic crisis within the Roman Empire must have placed an enormous stress on the military system, and the general paucity of archaeological finds (notably coins) from that period may well point to an intermittent rather than permanent occupation. A tell-tale sign in that respect is that some vici already seem to have been deserted around 240 CE, and many rural sites come to an end or are dramatically reduced in size in this period. However, the collapse of the limes was not the end of the Roman involvement in the region: the defence system was eventually restored in the 290s (Heeren 2017), albeit in a different form. Even when certain forts were completely abandoned, several others seem to be have been used intermittently in Late Roman times. Rural settlement densities in the Late Iron Age are thought to have been relatively low. A significant rise in the number and size of settlements has been extensively documented in the Early Roman B and Middle Roman A periods (25–150 CE; see Table 1.1 for the periodization used in Dutch archaeology). This is followed by a drastic decline in settlement density in the second half of the third century CE, which is usually linked to the collapse of the Dutch limes as a frontier. In fact, recent research suggests that the whole area was almost completely depopulated by the end of the third century (Heeren 2015; De Bruin 2017), before new settlers arrived in the late fourth century. The site inventories for the study region suffer from poor dating, making it difficult to be specific about the precise development of settlement numbers and inhabitants in the region (see also Chap. 2, Séguy and Chap. 3, Verhagen). The method we developed (Verhagen et al. 2016b) to take into account ambiguity and uncertainty of dating, using the principles of aoristic analysis, largely corroborated earlier assessments, although our results suggest previous underestimates of Early Roman Period settlements (see also Vos 2009) and overestimates of Late Roman site numbers. The development of settlement numbers in the limes zone throughout the Roman period using this method is presented in Fig. 1.2. The study undertaken by Van Lanen et al. (2018) of demographic patterns in the eastern part of the limes region confirms this general pattern, even when the exact numbers are different because of a different approach to using poorly dated evidence. Apart from the rural settlements, non-rural settlements started to appear in the area during the Early and Middle Roman period. The forts, associated vici and the urban centres were all installed by the Romans, and there is no clear evidence of rural settlements developing independently into real villages during the Roman period, even when some of them grew into larger sites with multiple farmsteads like Oss-Westerveld (Jansen and Fokkens 1999) and Wijk bij Duurstede-De Horden (Hessing and Steenbeek 1990). The only exception may have been the site of Rossum (Grinnes) which was already a larger settlement in the Late Iron Age (Roymans 2004). Growth of the ‘urban’ population is therefore closely tied to the military occupation of the area, with vici appearing alongside the forts mainly from 70 CE onwards. The number of forts is thought to have been between 16 and 21 with 350 soldiers each, bringing the total occupational strength to 5950–7700 soldiers (Van Dinter et al. 2014), and a similar number of non-military inhabitants in the vici, although not all forts have yielded evidence for an associated civil settlement. Apart from the troops needed to maintain the limes, the stationing of the 10th Legion in Noviomagus in the Flavian period implied an extra military force of 5000 soldiers plus approximately 2500 non-military inhabitants (Buijtendorp 2010) in the period 70–104 CE. The development of Noviomagus, Forum Hadriani and also Ceuclum (Cuijk) into urban settlements was a gradual process, but even at the peak of its expansion, the town of Noviomagus may not have had more than 3000 inhabitants (Buijtendorp 2010). For Forum Hadriani and Ceuclum, these figures may have been close to 1000 (Buijtendorp 2010) and 750 respectively (Haalebos et al. 2002). All non-rural settlements were deserted after the collapse of the limes in 275 CE, with only Noviomagus and Ceuclum being re-occupied in the Late Roman Period. Estimating the number of households, and thus the population per rural settlement is hard to gauge given that many of the settlements are known only from surface finds (Vossen 2003). Bloemers (1978) was the first to try to estimate rural population sizes in the Cananefatian civitas from settlement data, assuming that in the Early Roman period settlements on average consisted of one or two households with five to eight inhabitants. 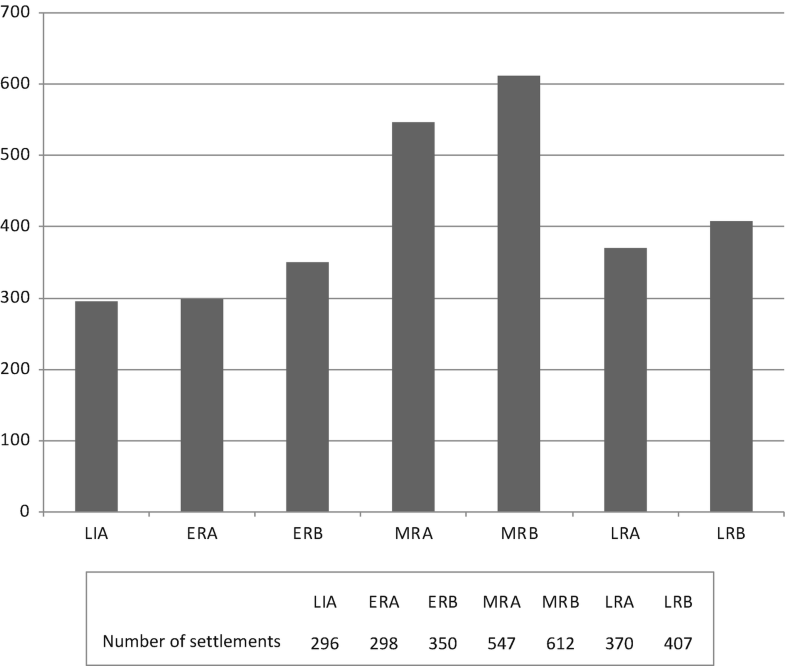 The size of the investigated settlements then increased in the Middle Roman period to an average of three to four households, an estimate that was repeated by Willems (1986) for the Batavian area. Vossen (2003) revised this average down to three and noted that large settlements of five or six households were exceptional. He also noted that settlements in the eastern part of the limes zone showed a range of sizes from single households to much larger settlements, which is also clear from our own data. Counting the number of registered house plans in our own dataset points to an average of 2.7 per settlement with 15.7% of sites showing more than five plans. These may, however, not all have been contemporaneous. Van Dinter et al. (2014), on the other hand, assumed an average for the west of the limes region of only one to two households per settlement. Extrapolations on the basis of these assumptions have led to population estimates for the second century CE ranging from 8000 to 16,800 for the Cananefatian civitas (Bloemers 1978; Buijtendorp 2010) and from 13,500 to 117,800 for the Batavian area (Willems 1986; Vossen 2003; Van Lanen et al. 2018). This large range is mainly due to lack of information on the actual site density, and our own estimates (see Table 1.2) suffer from the same problem. We will discuss the implications of these estimates in more detail in Chap. 3 (Verhagen), but it should be noted that, whatever the estimate used, the proportion of non-rural population in the area, in particular during the first part of the Middle Roman period, must have been substantial. Before the Romans arrived, it is supposed that the local population engaged in subsistence production only. A modest surplus of cereals could be achieved (see Chap. 7, Joyce) but was probably not actively pursued. The arrival of the Romans implied a fundamental change. A new and substantial demand for (forced) agricultural surplus production was created because of the deployment of troops in the region and the associated immigration of dependents, officials, craftsmen and others not involved in agricultural production, and because of taxation. Evidence for surplus agricultural production in the Dutch limes zone has been mounting for some time (Vos 2009; Groot et al. 2009; Heeren 2009; Van Dinter et al. 2014), and since the study region did not see the widespread development of specialized villa settlements, surplus production of in particular cereals and meat must have been achieved by the local communities. However, switching to a more ‘rational’ system of surplus production may not have been an easy transition. According to Erdkamp (2005), the ‘workers’ in pre-modern European small peasant households were chronically underemployed, and thus a large potential of unused labour was available. Part of this hidden labour surplus would have been used to meet the Roman demand for non-agricultural occupations, in particular military service (Roymans 1996, 2004). The remaining labour surplus may in theory have been used for increasing agricultural production. However, maximum productivity is ultimately limited by the availability of labour during harvest time. Without the possibility to hire extra (temporary) labour, the households’ production capacity can therefore never have exceeded what could have been harvested by the available workforce. According to Aarts (2013) there is no evidence of surplus production of grain or other crops in the pre-Flavian period, and surplus production of cattle and horses only seems to have started in the second half of the first century CE as well (Vos 2009; Heeren 2009). This would point to a connection of surplus production with the closer integration of the area with the rest of the Roman Empire after the Batavian revolt. Indeed, there is ample evidence for increased material exchange after 70 CE, and from that point on money is found all over the eastern part of the limes zone. This inflow of imported goods and money can be linked to the massive military presence during the Flavian period and the associated expansion of Noviomagus as Batavian civitas capital (Aarts 2013). It seems evident that the Romans started to trade extensively with the local population, although money must also have been introduced by returning veteran soldiers. The introduction of a monetary economy by the Romans would have made it possible to break through the economically inefficient system. With money, goods and labour can be traded more easily, supply and demand can be better balanced, and as a consequence economic growth becomes possible; it fundamentally changes the rules of the game. However, such a monetized, market-oriented system would work best in cases where a large non-farming population needed to be supplied, so it may not be the best suitable model for all of the Dutch limes area. The site of Rijswijk-De Bult (Bloemers 1978) shows interesting patterns in this respect. The settlement started as a single farm in the early first century CE, comparable to most other settlements in the region. In the second half of the first century, it grew into a small hamlet of four farms. The character and size of the buildings changed and gradually took on features of a Roman villa. The site was much bigger than most of the other settlements in the area. Van Londen (2006) therefore assumed that a limited number of larger farms supplied the town of Forum Hadriani with the necessary grain, meat and vegetables, and these farms were found close to the market. Further away, the farms would have been simpler, and may not have produced for the market. In some provinces they pay part of the crop, in some a fifth, in others a seventh; in still others a money payment. The amount is assessed by a valuation of the land itself. Set values are established for types of land, as in Pannonia, where the categories are: first and second class arable; meadow-land; first- and second-class woodland; fruit-bearing trees and pasture. For all these different land types a rate is established on a per iugerum 2 basis according to its productiveness. Hyginus goes on to state that the lands of the Frisii and Batavi were among those who paid their tax in kind. Hopkins (1980) estimates that the proportion of tax to be paid was in the order of 10% of the gross produce. As we know from historical sources, however, the taxes levied on the Batavians and Frisians before 70 CE were of a different kind. The Batavians were formally exempt from taxes because they were a valued ally of Rome, but in return they had to supply the army with soldiers. The Frisians revolted in 28 CE because of the taxation regime they had been subjected to: their tax was to be paid in cowhides. The land valuation system described by Hyginus depends on the existence of a land registration service. We do not know how landownership was organized before the Romans came, but we can suppose that in the pre-Roman period land was not sold, but redistributed mainly through inheritance and dowry. It can even be questioned whether there was such a thing as individual ownership of land. Once the Romans conquered an area, it was common practice to confiscate all territory and redistribute this in one of the following ways: return it to the original owners, assign it to colonists (mostly veterans), sell it to big landowners (from the senatorial order) or keep it as public land (as imperial estates with tenants). Given the initial exemption of tax for the Batavians, it seems plausible that the Romans simply assigned all the land to the local population and allowed them to manage it in the traditional way. After 70 CE, however, the introduction of taxation on the basis of a land valuation system seems probable (Groot 2008; Aarts 2013). It is assumed that this implied and is reflected in changes in parcellation. Roman surveyors would have registered and demarcated the land, and the boundaries would have been fixed physically, generally by digging ditches (Heeren 2009, 241–250). There is ample evidence that the Midden-Delfland area was newly parcelled out in the first half of the second century CE (Van Londen 2006). Road connections were improved, and the area was better drained to allow for more settlements. The Midden-Delfland landscape made it impossible to set out a standard rectangular centuriation pattern of parcels, so regular patterns perpendicular and parallel to local water courses were set out instead. This would have been coupled to changes in the practices of landownership, tenancy and taxation, and it may also have served to increase the general productivity of the region, possibly connected to the elevation of Forum Hadriani to the status of municipium . There is however no evidence that farms were relocated, which suggests that the inhabitants were given the right to remain on their lands after the restructuring of the landscape. In the Kromme Rijn area (Vos 2009), to the contrary, there are no indications for large-scale restructuring and reclamation of land. However, there is evidence for a different parcellation from Flavian times onwards, as is also observed elsewhere in the Batavian area (Heeren 2009, 241–250). Concluding, before 70 CE, the Batavians did not have to pay taxes and only supplied manpower to the Roman army. For the Cananefates the tax may (partly) have been in the form of cattle, just like for the Frisians. The restructuring of the Midden-Delfland area suggests that a formal land valuation system was only implemented in the early second century CE. The provisioning of the forts, which became a necessity after approximately 47 CE can therefore not have been part of a taxation scheme, which implies that the Roman military initially had to import their foodstuffs and/or buy them locally. After the Batavian revolt, we find indications that the area was subjected to land tax, even when some authors have denied this possibility (Willems and Van Enckevort 2009). In any case, it should be assumed that the frontier provinces were net importers of tax revenues (Hopkins 1980), since the upkeep of the military infrastructure was too expensive to be borne by those provinces themselves. This means that local taxation would not be based on what the army in the province needed, but on what the province could produce that could be used by the army all over the empire, or that could be easily transferred into money, since it would be too cumbersome to transport all goods over long distances. Since it is stated by Hyginus that the Batavians paid their taxes in kind, it seems most plausible to assume that the revenues from their lands were mostly used to directly supply the local army units and bureaucracy. The Batavians are thought to have paid part of their taxes in horses (Groot 2008), and these can be transported easily to the army units needing them. Such a system of course does not exclude the possibility of selling produce for cash, but most probably this will then have been sold on the free market. Since local taxation will not have been enough to supply the army with all it needed, tax income must have flowed into the area from other regions allowing the army to acquire labour and goods from the local population. This economic growth, however, was not sustainable without a continued military presence. The significant reduction of troops in the Lower Rhine region under Trajan in 103/104 CE (Alföldy 1968, 149–152) to about 60% of its previous strength would have had adverse effects on the local economy, which is reflected in a decrease in coin supply. The Roman authorities may have recognized the problem, and therefore have extended municipium rights to Noviomagus to counteract the economic downturn. However, since similar rights were extended to Forum Hadriani as capital of the Cananefatian civitas, where no large military encampment is found, this may not have been the only reason. Already from around 160 CE a decline of Roman settlement in the eastern river area has been signalled. Most probably, a number of interconnected events contributed to this (Vos 2009), including the assumed gradual reduction of Batavian recruitment for the Roman army (Van Driel-Murray 2003; Van Rossum 2004), which led to a further decrease in money supply, the Antonine Plague that ravaged the empire between 165 and 189 CE, and coastal raids by Chaucian pirates around 170–180 CE. Furthermore, a fire which ravaged Noviomagus around 170 CE significantly reduced the town’s size. Jongman (Chap. 6) provides more background on the negative economic effects on the Roman Empire of epidemics and its prolonged political crisis in the third century. In particular, the population decline following the epidemics was coupled to an overall decrease in productivity and living standards. There is little concrete information on economic developments in the region after the mid-second century. The fortification of Forum Hadriani and Noviomagus with city walls, the replacement of wooden by stone-built forts, and the establishment of a coastal defence system in the late second century all suggest that serious investments were made to protect the area from outside invaders. Under the Severan emperors in the early third century efforts were undertaken to restore Forum Hadriani and to repair the castella . De Bruin (2017) notes that the material culture of the Cananefatian area in this period is becoming more and more comparable to that of the rest of the Lower Rhine area, indicating increased exchange within the province of Germania Inferior. After ca. 240 CE, however, there are no longer any clear signs of building activities and repairs, pointing to a withdrawal of imperial investments in the region. The last reported building activity in the Cananefatian civitas is the erection of a milestone in 250 CE at the site of Wateringse Veld (Waasdorp 2003), and this was paid for by the local community. It is not very evident how these developments influenced the rural economy in the region. Some changes in settlement pattern are already visible in the first half of the third century: most settlements in the Midden-Delfland area do not last beyond 210 CE (Van Londen 2006), but this may be due to the specific environmental characteristics of this area that was confronted with rising water tables. Vos (2009) also observes a decline in settlement density in the Kromme Rijn area starting in the first half of the third century. As long as the forts, vici and ‘urban’ centres were inhabited, however, there would have been a market for agricultural surplus production. In fact, the site of Rijswijk-De Bult seems to have been inhabited right up to 270 CE (Bloemers 1978). Heeren (2017) also confirms the continuation of habitation in much of the area until the end of the third century, albeit in smaller-sized settlements. The collapse of the limes, however, also must have signified the end of the ‘urban’ economy. The rapid and almost complete depopulation of the area after 275 CE (Heeren 2015) may therefore have been a consequence of the surviving urban population relocating to safer areas, with the rural population having no other choice than to follow. It has even been suggested (De Bruin 2017) that this move was forced upon the population by the Roman authorities. The iugerum is a Roman area unit corresponding approximately to 0.25 ha.